Newest Member of the Crossfire Family! 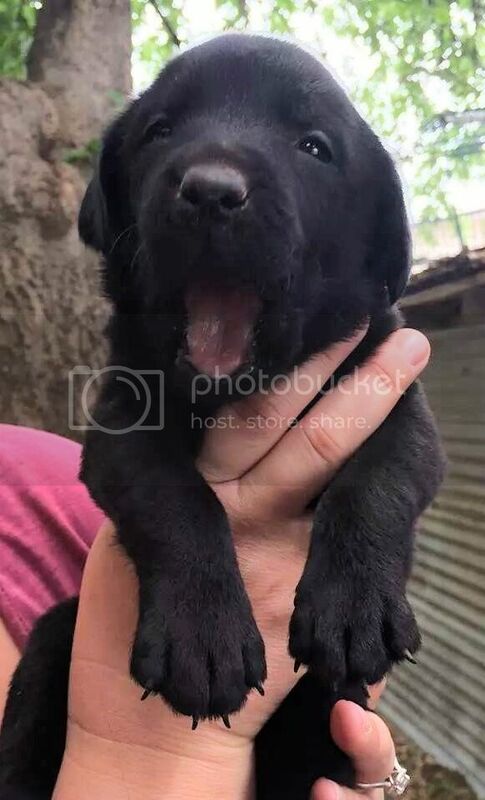 4 week old, female black lab. This is gonna be our newest hunting buddy. (We hope) She will be coming home to us about the end of June. She needs a name. And any tips or tricks you guys have for training a bird dog - well, just pass 'em on, please. She's a beauty, maybe Bullitt or Rayne? We name our dogs after fictional TV or movie characters. Name, pick any two syllable name. Single syllable names often sound similar to commands (rex sounds like fetch, buck sounds like duck, ect). My current retired hunting dog is honyok. For training, purchase "Training Your Retriever" basic and advanced. I have trained my last 4 dogs with those DVD's. Training tip: 5 minutes a day every day is FAR more effective than one hour every Saturday. Richard Wolters' Water Dog is the Bible for retriever training. I'll echo the 5 (to 15) minutes a day is far better than and hour or two on Saturdays. I used to get up and work my lab at 4AM for about 10 minutes before I went to work. Still walk with her every day at 4 and she gets some good exercise in fetching whatever she can find for me to throw. Lo que no puede cambiar, tu que debe aguantar. Cute pup. How about Backfire? Gaston (as in Glock) She is beautiful. She looks like she should be named Roxie Crossfire. Cute pup, congrats. I have a nice e-collar and training video we used with our lab. I forget which one but it is one of the better ones that can be used in the field (ie waterproof). I'd be willing to trade for something of equal value as I don't use it anymore. Yes, she does. Both parents are hunters. The owner of the dad says they never trained him to retrieve. Just took him out to the field, and he fetched birds. Not sure I completely believe that, but we can be hopeful! We plan to start basic obedience training as soon as we get her, and take her to the range with us as often as possible to get her used to the sound. I have raised plenty of German Shepherd dogs, so I know obedience training, but we have not had a retriever before. We will keep y'all updated on the progress.